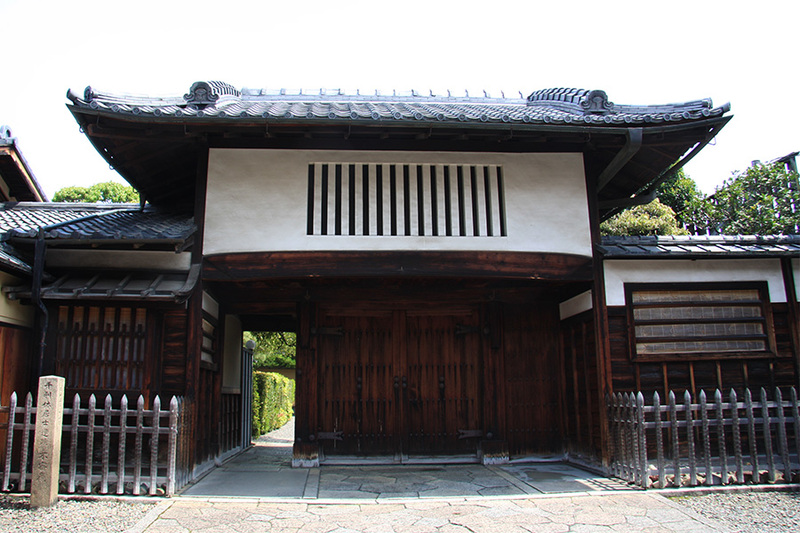 The Omote Senke school of tea was founded in the 1600’s by the great grandson of Sen no Rikyu. In addition to their modern administrative offices, the original site of the school has a number of tea rooms and a garden of impeccable refinement. 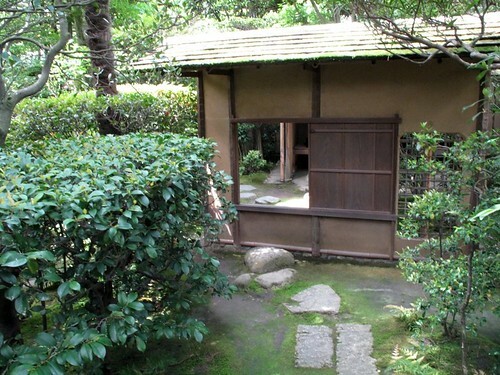 Omote Senke is one of the great architectural and cultural treasures of Japan and one of its finest examples of wabi-sabi (refined rusticity, understated and natural beauty, unpretentious, warm, intimate, nurturing, quiet, peaceful, etc.) It is a private place, where only a small number of people study. Very few others ever get to go inside to look around. I was able to visit there one time, about 10 years ago, but never thought I would return again, even though I am now a student of Omote Senke tea. Eventually, however, I was able to visit again. This time I was on the coattails of two special guests from Australia for whom I was asked by my tea teacher to translate. 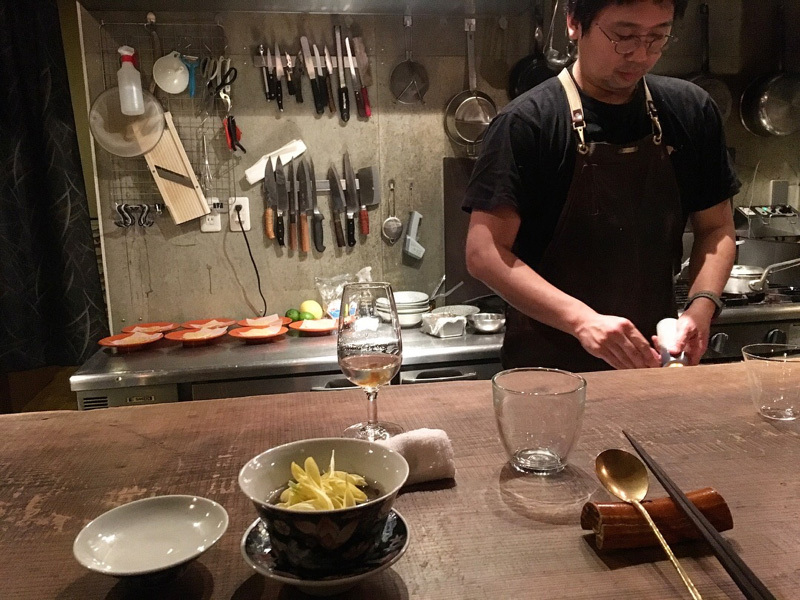 When originally introduced, the Rikyu concept of tearoom was found unusual because it was so small and intimate. Several things about tiny Rikyu-designed tea rooms make sitting in them for several hours surprisingly comfortable. 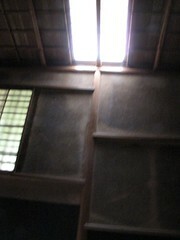 First of all, the ceilings are divided into 3 separate ceilings, each made with differently textured materials. Two parts are flat, one is slanted. Looking up at such a ceiling from a seated position on the floor gives a feeling of expanded space. 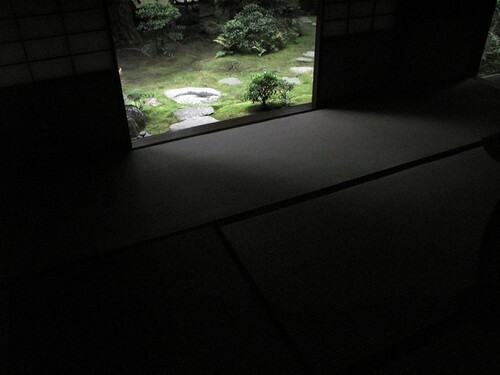 Next, the fact that such rooms are only lit by very dim natural light and thus create visual deprivation, our other four senses become more alive. Referred to as “the wind in the pines,” this sound of the water simmering in the kettle that might not even be noticed in a brighter room, can be almost hypnotically beautiful in a dimmer room. The enjoyment of incense in such an environment is a brief but heightened moment. Unlike incense that is burned for extended periods of time, it is only burned for a few moments in a tea room. The incense used is of the highest quality–a truly rarified fragrance. Finally, because the tiny bit of incense is placed somewhere within the kettle-heating charcoals, no one knows when it will release its exquite scent, so there is an element of surprise. Also in the dim light, there is a heightened experience of the texture of the bamboo, lacquer and ceramic implements in the hands and the feel of the bowl on the lips. I often think of the words of Sen no Sotan, the grandson of Sen no Rikyu.